NickSchiwy.com > Mobile Devices > Microsoft Lumia 735: Is Windows Phone A Viable Platform In 2015? Despite Microsoft having laid off a great deal of the people working in the hardware division of Windows Phone last month, they seem to maintain that their strategy with Windows 10 is to increase their overall user-base of the Windows Store, luring in developers to build up their struggling app ecosystem. That’s no easy task, but it’s definitely what they need to get Windows Phone to be more relavant. I spent a few weeks with the Microsoft branded Lumia 735 from Verizon and I was fairly pleased with the device itself, but the ecosystem is still what has Windows Phone dragging behind the pack. As I took the crisp Lumia 735 from its box, I quickly realized that it has the exact same design language of every other Lumia device that has been sold in the last 3 years; and that’s not a bad thing. Despite its plastic shell, it’s still pretty slick looking and I actually had a few people compliment the look of the phone; something my OnePlus One has seldom gotten. That said, it is rocking a plastic shell that basically accounts for the entire identity of the device. Even the buttons are built into the shell, so if your back breaks and won’t stay on you’re probably going to need to buy a new one. I’m not going to sugarcoat this, the spec sheet on the Lumia 735 isn’t going to impress anyone. In fact, Windows Phone has never really been packing the latest and greatest inside. Whether this is because they simply don’t need it or they want to keep the price down is yet to decided, really, but I feel like it leaves you with a bit to be desired. That said, this isn’t meant to compete with the “flagship” phones of today. It can be purchased off contract for $192, so its nearest competitor is probably the Moto G.
Compiled from information on Verizon’s Website and GSMArena. Bottom line: In the time that I was using the Lumia 735, I think I charged it twice. You can use the it all day and then some. If you’re a light user, you can probably go a few days without charging. It’s like the days of old with the Nokia brick phone that you only charged once a week. Plus, it has Qi wireless charging built into the back so you can ditch the microUSB cables if you want to (though that’s always there in a pinch). Carl Zeiss is a name that photography junkies associate with some of the highest-class camera lenses in the world. They’re in every single Sony professional camera. According to a Nokia interview cited by WinBeta, Zeiss had interest in bringing their lenses to mobile photography long before there were even cameras in phones. With such care for detail being associated with Carl Zeiss, one would assume that the camera that is using their lenses would be top of the line. The fact of the matter is, however, Nokia has been sticking Zeiss lenses into their phones for a long time and we all know that flip phones had potato cameras on them. The point of all this is to say that the camera on the Lumia 735 can take decent pictures. They aren’t iPhone or Samsung Galaxy S6 quality pictures, but they aren’t all that bad either. There is a lot of noise in pictures that are taken in low light, but what is a camera with no optical zoom to do? Pictures that are taken outdoors (or just with plenty of light) can come out well, but there are some places where it is really blown out (seemingly worse on pictures when its overcast). The bottom line on the camera is that it’s not the worst phone camera I’ve ever used by any means, but it’s also not the best. If the camera is a high-priority for you, the Lumia 735 probably isn’t for you. 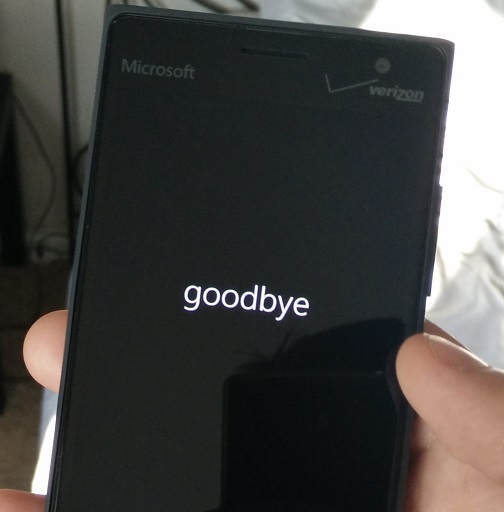 Windows Phone 8.1 is incredibly stable. It’s even better than Windows Phone 8 was on the Lumia 928 that I reviewed last year. There were times that I experienced a little bit of lag, but that was more than likely because of the Snapdragon 400 in the Lumia 735. Windows 8.1 came with a great deal of upgrades over Windows Phone 8 including Cortana, swipe keyboard, and an actual full-screen mode that hides the navigation keys much like on Android phones that have on-screen navigation. The “Hey Cortana” wake phrase that is available on Windows 10 PCs now is not available on the Lumia 735 and likely never will. Microsoft has said this, but it makes sense since the Snapdragon 400 doesn’t have the speech recognition core that the 600 and 800 series SoCs have. Despite the Lumia 735 being a Verizon phone, there only seems to be one Verizon-specific piece of bloat loaded onto the phone and that’s NFL Mobile. There’s also Skype, Slacker Radio, and Facebook that are bundled with the phone, but these are probably works of Microsoft rather than Verizon. The good news, however, is that on Windows Phone you can uninstall any of these apps and never worry about them again. HERE Maps is still the Map application of choice on Windows Phone 8.1 and though this is a Microsoft Branded Lumia 735, you will still need to sign into your Nokia account to gain whatever special cloud features are involved with HERE Drive+. It should be noted that HERE is a company that is still owned by Nokia (the part that wasn’t purchased by Microsoft), but it’s interesting that Microsoft develops their own maps system (Bing Maps) and doesn’t bother to integrate it with their phones that now presumably have no connection to Nokia. Cortana may not be able to be summoned using the “Hey Cortana” hotword, but it still has plenty of tricks up its sleeve. Much like Google Now, Cortana is a virtual assistant that brings you information that it things you will be interested in. It also uses its statistical mind-brain to determine the results of sports match-ups. My favorite feature of Cortana, by far, was its ability read out text messages and allow me to reply while I was driving, much like the Moto X does with Moto Voice. What’s more, it somehow managed to interrupt the radio when it was connected to the Bluetooth, even though it wasn’t playing the Bluetooth audio input. Kudos, Cortana. I’m just going to skip to the bottom line with the speaker on this phone: it has one. It’s a rear-facing speaker that is really easy to cover with your thumb and I’ve done it accidentally more than once. It sounds fine, but make sure you lay it with the screen down if you want to hear it. This is par for the course on Lumia devices and it’s likely they aren’t going to change their design language until they have more money for R&D being sent their way (which as previously mentioned probably won’t happen until more people start buying Windows Phones). There were several things that I noticed while using the Lumia 735 (both good and bad) that I thought deserved mentioning. First I will address the network situation. This is a Verizon branded phone with Verizon bands under the hood. Of course it does that very well and thanks to Verizon’s massive network, I never had any trouble getting a signal and 95% of the time that was an LTE signal. However, thanks to a mandate from the FCC concerning a purchase of 700MHz C Block spectrum, Verizon now sells all of their phones carrier unlocked. This phone is no exception and it also seems to see a little bit of overlap with regards to LTE bands that are used by AT&T because I was able to occasionally connect to LTE with my AT&T SIM in the phone. That all sounds well and good until you take a closer look at how the Lumia 735 operates with another carrier’s SIM installed. One of the first things that I needed to do was change the APN settings so I could connect to the internet and send/receive MMS messages. It seems Verizon/Microsoft disabled the ability to change the APN settings on the phone, effectively crippling the phone for use on other networks. I know this wasn’t something that I had to deal with on the Lumia 928 so it seems that this is something that Verizon and Microsoft cooked up in time for the Lumia 735 to be released this year. Though it’s technically legal, it’s still super shady of Verizon to pull that kind of stuff. One thing that I’ve noticed among all of the Windows Phones that I’ve used is that the platform looks about 30x better when it is on an OLED display (which this has). When you’re on the home screen you have all of your colored tiles and a black background and on an OLED display it’s like having live tiles floating in a sea of complete darkness and it’s absolutely gorgeous. I picked up a Nokia Lumia 635 last December, which has an LCD panel and it just doesn’t look as striking as the colors on the OLEDs do. One notable feature in relation to the display is that the Lumia 735 also has double-tap to wake. I’m not sure if that’s a feature of Windows or the phone, but I suspect it’s the phone. That’s a really nice feature to have and you sorely miss it if you ever pick up a device that doesn’t have it, these days. The Lumia 735 will only run you $192 if you buy it outright, so it’s really a decent deal for what you’re getting but at the end of the day the Windows Phone platform is still lacking on the app ecosystem. As a matter of fact, Windows Phone 8.1 (and later this year, 10) easily gets the best battery life of any mobile platform and it can do everything that you want it to, it just doesn’t have the apps that you want to do them with. There’s no official Gmail app, but Microsoft will give you a Google Mail app. There’s no official YouTube app, but Microsoft will give you a web wrapper for YouTube, there’s no Snapchat app, but there’s TemPic, a totally unrelated service that does the exact same thing. There’s no Play Store or iTunes App Store and you’ll just have to deal with that. The Lumia 735 doesn’t have a very good camera and the app ecosystem on Windows Phone is still lacking considerably, but if you don’t mind using Spotify instead of Google Play Music and Microsoft OneDrive instead of Google Drive you’re probably not going to care that much and you may even enjoy it a little more than your old smartphone.